We continue to be amazed and delighted at watching our Kinder patch grow and mature. 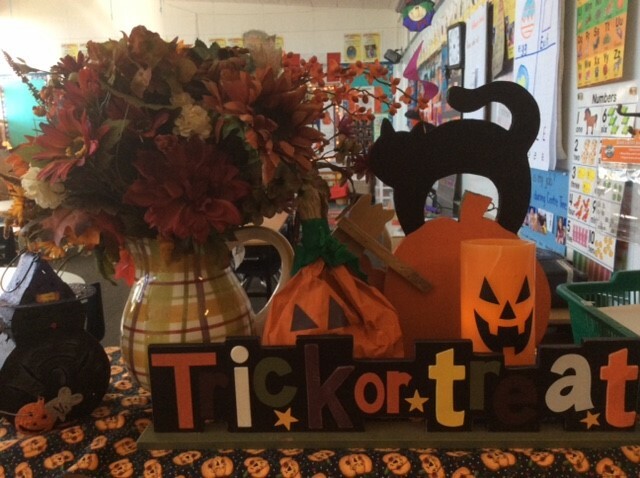 Although we’re still over a week away, we’ve having fun decorating our classrooms in anticipation of the BIG Day. Today we were informed that the children are VERY EXCITED about Hallowe’en. The countdown is on…. 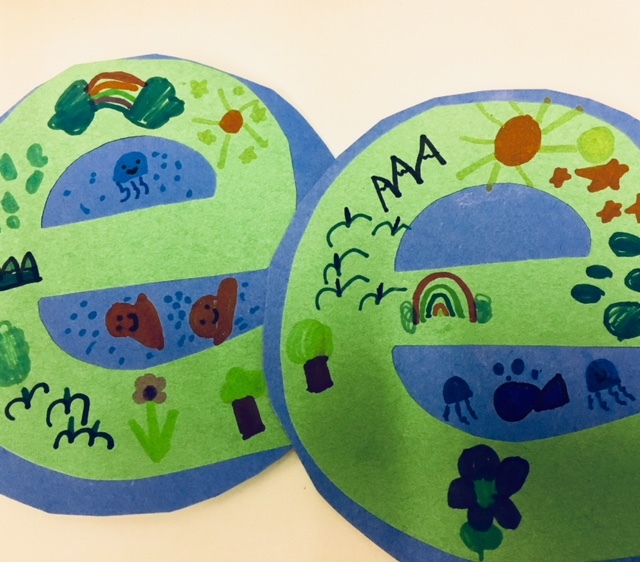 But we better go back to the beginning…starting with our Alphabet work on the letter E. We made our sweet “e is for Earth” craft and tried to include everything we love about the Earth’s gifts to us — rainbows, flowers and trees, snow-capped mountains, spouting whales and more. We’ve started printing in our beautiful Alphabet books that will be a special treasure your child will bring home at the end of the school year. Because all thoughts have turned to Hallowe’en, we’re creating shared language experiences by discussing Hallowe’en vocabulary. 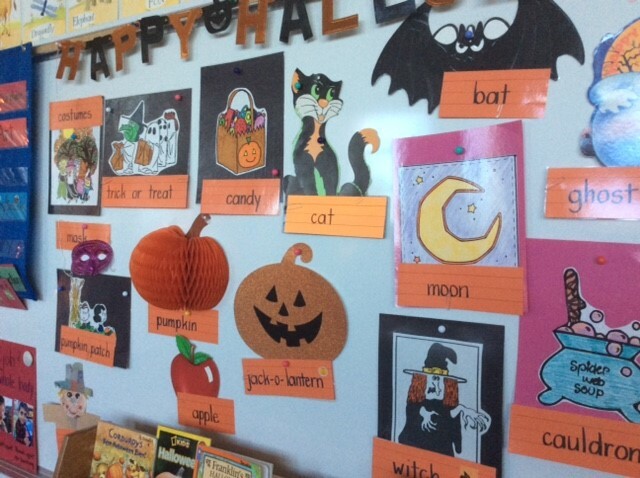 We’re building a word bank of pictures and labels, and it’s been very enjoyable to hear the children talk about their pumpkin patch adventures, describe the differences between a pumpkin and jack-o-lantern and explain exactly what “trick or treat” means. In Math we’re working on creating and repeating ABC patterns during Free Exploration time. The children are learning that each pattern should repeat itself at least three times so we know it is a true pattern. We’ll make some fun Hallowe’en patterns in the upcoming days. 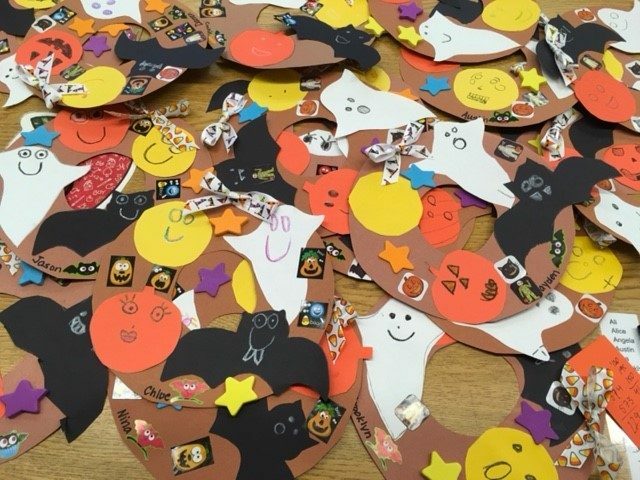 Of course our highlight of the week was making our Hallowe’en wreaths with our Big Buddies on Thursday. We’ve been practising using templates, spreading our fingers to hold them firmly in place before tracing, then cutting them out. We had some decorating fun with silly faces and lots of stickers to create a lovely display in the classroom. We painted these little bodies in anticipation of Bat Week next week in Kindergarten. We’ll finish them with our Big Buddies. 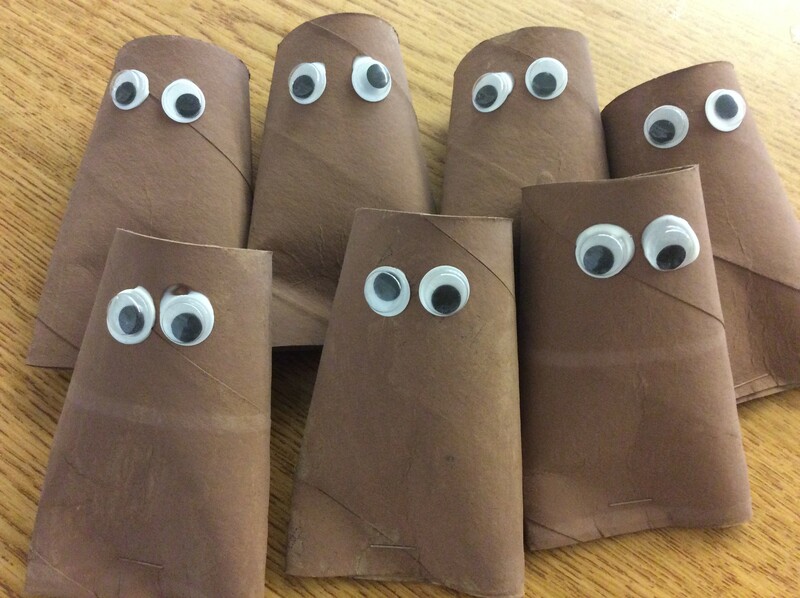 We’ve asked the Grade 7s to bring a Hallowe’en storybook to Buddies to share with our children on Wednesday. We’ve had a couple of rainy weather days now in October. At Ridgeview, unless the rain is a deluge, the children are expected to go outside for morning and lunch recess. Thank you to everyone for sending in a raincoat with your child. Students should also have a pair of boots to wear outdoors; it’s not healthy for the children to wear wet socks and runners on their feet for the remainder of the day. At the same time, we do not want students to be wearing their boots all day; all children should be wearing runners or other indoor footwear in the classrooms and hallways. Children are not to wear boots in the gym. Ridgeview is holding our annual Hallowe’en Parade and Assembly on Tuesday, October 31. The children are invited to dress up and we will be part of a parade that makes it way through the classrooms and hallways to the gym for our Assembly. Please remember that children are not allowed to bring weapons to school as part of their costume. This includes swords and light sabres. These are best left at home. On Wednesday, November 1 we will have a late morning start. School will not begin until 10:40 am. Library Book Exchange on Wednesday for both classes. Tuesday, October 31 is our annual Hallowe’en Parade and Assembly. Parents may watch us parade down the halls of Ridgeview! Wednesday, November 1 is a late start for all students. We will not begin school until 10:40 am. Dismissal will be at the regular time of 2:55 pm.